Familiarity helps because people need to know who to trust. Being on the receiving end of caregiving takes a lot of courage, so you can help by making sure that your parent recognizes and feels comfortable with the person hired to give them assistance. Making sure that they know the caregiver’s name and their schedule also gives a sense of stability since your parent will know what to expect. Interruptions to schedules should be minimized, and there should always be open communication between you, your parent, and the caregiver. Your parent must feel comfortable with sharing how they feel. Everyone has their preferences for how they want things done, so although there should be some acceptance and tolerance from both the caregiver and your parent, that shouldn’t mean that complaints aren’t allowed. Life is very different when you’re not able-bodied while trying to take care of your own needs, so feedback from your parent is valuable and is a good sign of their involvement. Let your parent know that you’re there for them, although you can stress that direct communication is most effective. Independence is important for feeling empowered. It’s best for you and your parent to think of the caregiving relationship as a partnership where your parent’s freedom is not being taken away. The caregiver helps to lighten the load, but your parent will also contribute to keeping their space the way they want. A caregiver can bring help and happiness in your parent’s life. By taking the right steps, your parent will be able to make the adjustments, provided they have enough time and support. 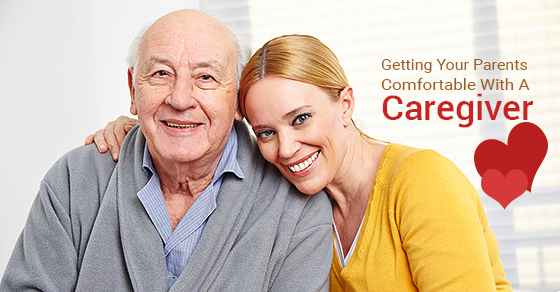 Talk to us to learn about your options for caregiver assistance.